Sales of the BMW 7 series nearly doubled to 4,742 in January. The BMW Group started 2010 with a 16.6% increase in global sales. The German automaker sold 82,120 units of its BMW, Mini and Rolls-Royce brands in January compared with 70,419 during the same month in 2009. “Thanks to the large number of new, highly-attractive models, such as the new BMW 5 series and the Mini Countryman, we are aiming for growth in the single-digit percentage range for 2010, and intend to sell more than 1.3 million vehicles,” Ian Robertson, BMW board member for sales and marketing, said in a statement. In January, BMW brand sales rose 15.9 percent to 69,852. BMW got a big boost from the BMW 7 series. Sales of the flagship sedan nearly doubled to 4,742 from 2,498 during the same month in 2009. Although its sales were up 5 percent to 8,800 units in January, BMW expects a decline in sales of the 5 series ahead of its replacement starting in late March. “From the second quarter on, the new (5-series) model – together with the new, recently launched BMW X1 and BMW 5 series Gran Turismo models – will give sales a further boost,” Robertson said. 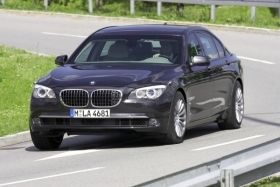 The BMW 5 series Gran Turismo and the BMW X1 joined the BMW model range in late October. Mini sale increased 20.4 percent to 12,181 last month while demand for the new Ghost more than doubled Rolls-Royce’s January sales to 87 cars from 37 during the same month last year.